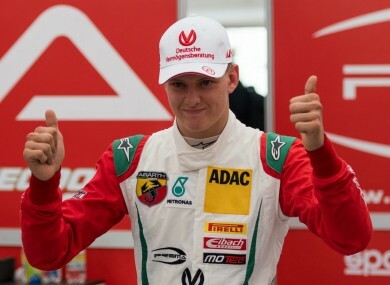 BERNIE ECCLESTONE HAS backed Mick Schumacher to follow in his father Michael’s footsteps and race in Formula One in the future. The 17-year-old will race in the Formula Three European Championship this year with Prema Powerteam after impressing at Van Amersfoort Racing in F4. With reigning F3 European champion Lance Stroll preparing for his first F1 drive with Williams in 2017, Schumacher Jr’s rise led to speculation he could soon be on the stage his father – who is continuing his recovery from serious head injuries sustained in a skiing accident in 2013 – dominated for over a decade, winning a record seven drivers’ titles. Schumacher Jr has spoken of his desire to reach the pinnacle of motorsport one day, and F1 supremo Ecclestone believes it would be good for the sport to see the youngster get a drive. Speaking to Sport Bild, the 86-year-old said: “If he is anywhere near as good as his father, why not? Schumcaher Jr began his racing career in 2008, using his mother’s maiden name, Betsch, to avoid attention. Email “Ecclestone keen to see Schumacher Jr in F1”. Feedback on “Ecclestone keen to see Schumacher Jr in F1”.